As you may or may not know, grocery shopping is one of my favorite things to do, and my kids typically have a good time doing it as well. Our neighborhood grocery store is a place we goseveral times a week and everyone knows us. It’s really close to our house, so I don’t feel bad hopping down there pretty frequently. Anyway, when I pack up the kids and take them with me (that’s most of the time), it takes a little more planning and effort. Here is what grocery shopping with my kids usually looks like. 1. Park not in the closest parking space to the door of the store, but in the closest parking space to a cart return (for easy pick up and drop off). 2. Hold one kid on your hip and hold the other’s hand because, of course, there weren’t any carts in the cart return. 3. Choose the cart with two seats and steering wheels. 4. Buckle in your toddlers. 5. Wait for your oldest to complain because she wants to use a “little shopper” cart instead. 6. Unstrap her and let her pick out the “little shopper” cart of her choosing. 7. Wait for her to bash your ankles while you unstrap your second toddler. 8. Put second toddler into a regular cart, because you can’t seem to justify taking the one with the steering wheels for just one kid. 9. Finally enter the store. 10. Get your ankles bashed, because your daughter eyed the lovely display of donuts inside the door, instead of watching where she was going. 11. Tell your daughter you can get donuts on a different day, if she stops bashing your ankles. 12. Peruse the produce quickly, giving only the most durable items to your “little shopper”. 13. Watch as a carton of blueberries is dumped sideways and hits the floor. 14. Shout, “Freeze!” so that the least number of blueberries are smashed. 15. Stoop down (around your swollen, 39-week belly) to pick up any whole blueberries that are left. 16. Add the partially-full carton of blueberries to your cart, because you feel bad spilling half of them out and then putting them back. 17. Feed the toddler in your cart a quick snack, because he’s burned up all his calories watching you clean up the blueberries. 18. Skip over the rest of the produce and head to the meat department, because who needs veggies today? 19. Grab chicken and steak and get the heck out of the meat department, because your “little shopper” is already in the dairy section, headed for the eggs. 20. Give the toddler in your cart another snack, because he’s eyeing the not yet purchased bananas. 21. Take out the salted butter (why?) and the store-brand can of biscuits (still why?) from your “little shopper’s” cart. 22. Get both of the last two gallons of organic whole milk, and cry because the price went up again. 23. Say no to the ice cream. 24. Wipe away the tears, and say no to the ice cream. 25. Explain that you’ve already got ice cream in the freezer at home. 26. Offer ice cream for lunch on the condition that you don’t have to get a second container of ice cream. 27. Go to the check out line. 28. Leave your cart in the line, and go retrieve your little shopper from the ice cream aisle (thankfully not far away). 29. Come back to the line with your little shopper and her ice cream. 30. Get your ankles bashed because the little shopper is eyeing the candy. 31. 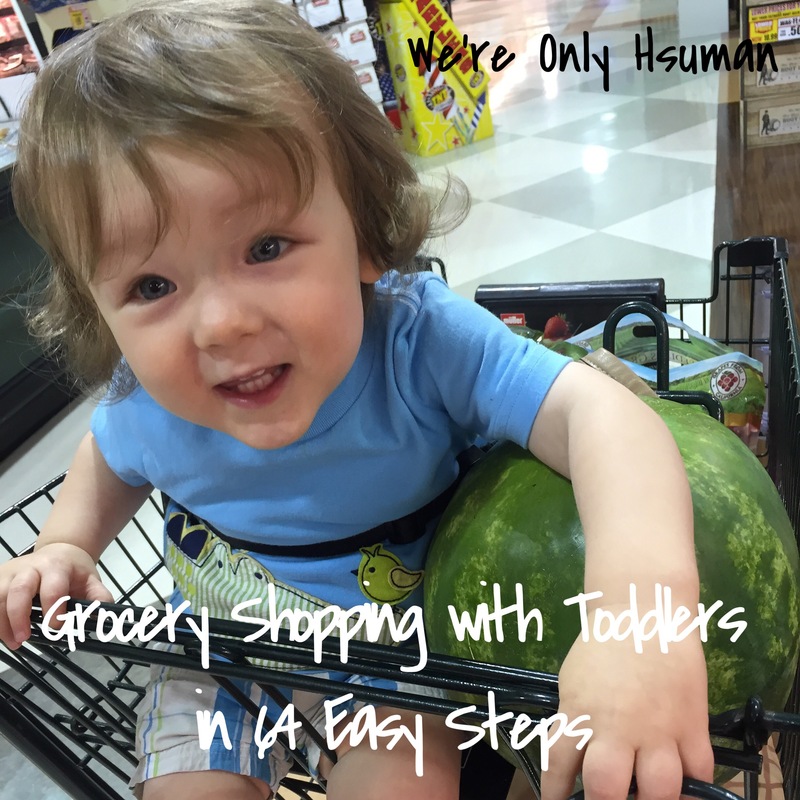 Give in and let the toddler in your cart watch videos on your phone while you help bag the groceries. 32. Say no to the M&Ms. 33. Say no to the York peppermint patty. 34. Say no to the random candy bar you’ve never heard of, but now you want to try. 35. Peel your “little shopper” off the floor. 36. Give her the “special job” of returning her tiny cart. 37. Swipe your card and bust it after your little shopper before she hits the parking lot (her logical next step after returning her tiny cart). 38. Realize you forgot the eggs. 39. Resign yourself to not caring. 40. Scoop up your little shopper as she’s activating the automatic door. 41. Squish her in, even though there’s no room, next to the toddler already in the cart. 42. Watch the hair-pulling begin. 43. Walk as quickly as you can to the car, waving one hand in the air to the oncoming traffic. 44. Smile apologetically at the cars who stopped to stare at your toddlers making a scene. 45. Thank God for the button that cranks the car before you get there. 46. Wrestle toddler number one into his seat. 47. Give him back your phone with the videos to watch. 48. Wrestle toddler number two into her seat. 49. Explain that you only have one phone. 50. Try seven other methods of distraction. 51. Finally pacify her with a banana. 52. Pack groceries into the car. 53. Take cart to cart return. 54. Praise yourself for parking so close to it. 55. Get in the car, already nice and cool. 56. Turn around to look at toddlers, and see banana in everyone’s hair. 57. Turn back around like you didn’t notice. 60. Give them ice cream. 62. Think of several other things you didn’t get, and figure you’ll just do without them till the next trip. 63. Ice your bashed and bruised ankles. 64. Hope the next trip isn’t for a while, but know it’ll probably be two days later. Hahaha hilarious! I say snacks. It’s all about the snacks and samples and snacks. Lol. Ahhhh…I do not have those days anymore…but hoping for grand kids! I will keep the list! Haha hopefully a few more years till then!